Preliminary design plan for Battleship # 36. This design incorporated the new concept of "all-or-nothing" armor protection, reducing the area protected by armor but increasing the thickness of armor significantly where it was provided, such as the main side belt and on the turrets. 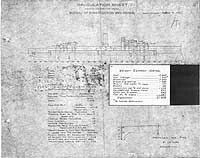 This drawing was sent to the General Board on 14 March 1911, together with a plan of 11 March (see Photo # S-584-005) and a third plan, not part of this collection. These designs were meant to meet characteristics issued on 28 June 1910 and funding approved by Congress on 4 March 1911. Battleships Nevada (Battleship # 36) and Oklahoma (Battleship # 37) ultimately were built to a similar design (see Photo # S-584-009). 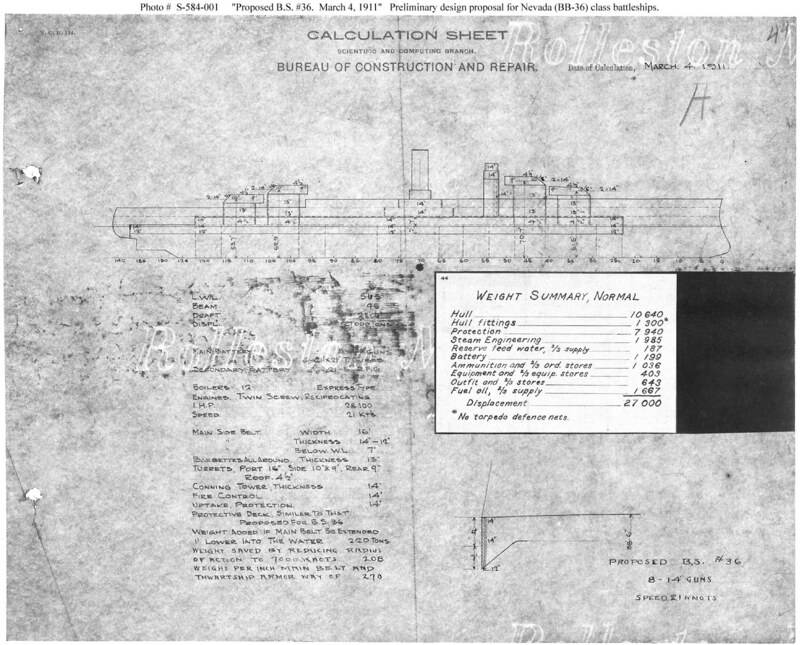 This plan provides eight 14-inch guns, reciprocating steam machinery, and a speed of 21 knots in a ship 565 feet long on the load water line (L.W.L. ), 95 feet.in beam, with a normal displacement of 27,000 tons.